So last night was the first time I ever participated in a chili cookoff. 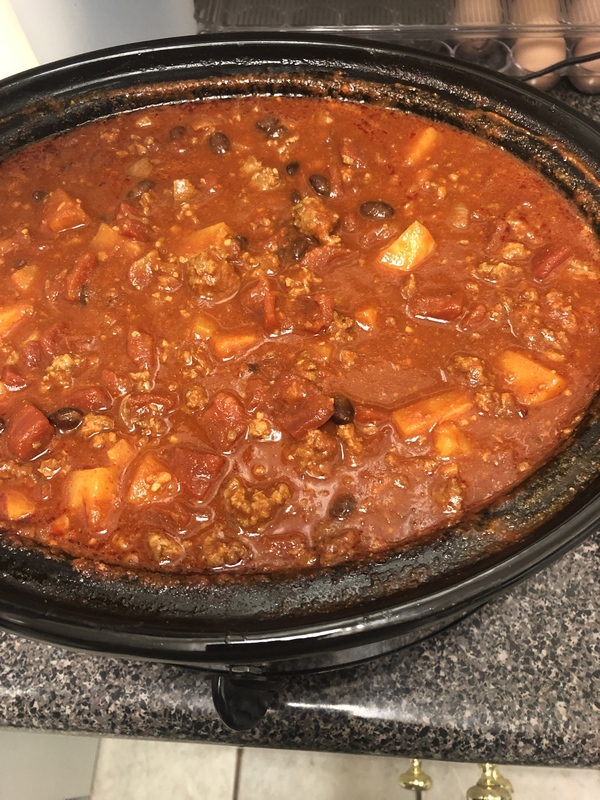 I remembered having a chili a long time ago and set out to find a recipe for it. Italian sausage and pineapple chili. Won The People's Champ award and runner up from the judges. Feel like being the first chili handed to the judges hurt my score because they were doing a ranking system instead of points. Which as a side poll, should the judges be given a second taste if they request it? "Hate is an acid that does more damage to the vessel in which it is stored, than the victim on which it is poured." "Ego is the anesthesia that deadens the pain of stupidity." I bet that was good. There is a place for sweet in chili. And the pineapple certainly provides that. Last edited by Irishguy; 02/11/19 07:46 AM. Nice job! Been wanting to enter a cook off myself. Formerly known here as Reefd! Everything you desire is on the other side of your fears. Brown sausage and onions, drain and add the sausage and onions to crock pot. Add the pineapple juice to the crock pot. Keep the fruit in the refrigerator (it will be added toward the end of cooking). Cook on low (6-8 hours), adding pineapple during last hour or two of cooking, or on high (4-5 hours), adding pineapple during last ½ hour - hour of cooking. Thanks for posting the recipe, but the last sentence doesn't make sense. If you are cooking on low, don't add the pineapples until the last hour or two. If you are cooking on high, don't add the pineapples until the last 30 minutes to an hour. This maintains some of the pineapples texture and doesn't make them real mushy. You can add them all in the beginning and the chili will still be good, but they will be extremely soft and cooked down. The only chili cookoffs/contests I've ever done have been for fun/charity and I don't really care about the judging. I figure they are all probably pre-determined. Won two over the years, but never lost a single one cause I got to cook, hang out with good people, eat great chili and drink a bunch of beer. The Italian sausage is great in chili. Friend makes chili with it and elk every year. Adds corn to it also different but great! !